IT WASN’T UNTIL he was set to embark on his ring walk at the Genting Arena earlier this month that it truly dawned on Bradley Skeete that, for the first time in his professional career, he was playing an away fixture. 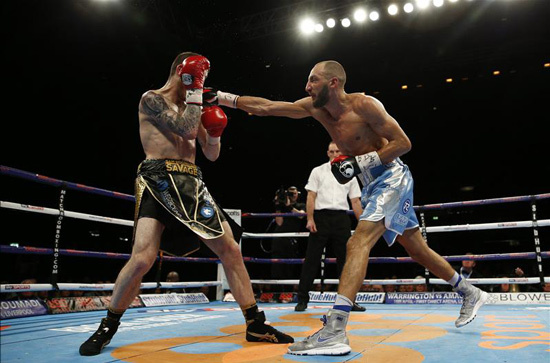 Skeete’s away-day yielded a bountiful return with his slick style skillfully extracting the British and Commonwealth welterweight title from Birmingham’s Sam Eggington. ‘Savage’ Sam was well and truly tamed over 12 rounds by ‘Super’ Skeete, with a landslide points triumph multiplying his belt collection. “Going away up to Birmingham, I sort of wanted to do it that way, because I was the underdog, I was on a rival promoters’ show and these matches don’t usually happen,” reasoned the 28-year-old, who last week resumed work at the iBox Gym in Bromley. “I wanted to be the one to go and do it – and I did. “I did it as an amateur all the time, going away and boxing abroad, but as a pro it has always been the York Hall, Wembley, Copper Box. Until hostilities kicked in when the call came signalling departure time from the sanctuary of the dressing room. “The point I noticed I was away from home was when they brought me out for my ring walk and left me standing there for ages. You didn’t see it on TV, it wasn’t in the corridor but in the walkway with fans calling me every name under the sun and a few things got chucked at me. And getting cracking he did, propelling spearing jabs into the brow of Eggington from the off – with little in the way of return fire – as the gameplan devised by trainer Alan Smith was executed to perfection. Seasoned Skeete watchers will testify that patience is one of his many virtues in the ring, but once his opponent is ripe for the picking, he favours freeing up the hands and going for the jugular. Only this this time trainer Smith had him strictly programmed for a 36-minute examination and was not about to accept his man taking any risky shortcuts, no matter how brow-beaten the home favourite appeared. When punches started being dispatched with pinpoint accuracy from waist height at the midway point in the contest, it wasn’t a song of praise being recited in his corner between rounds and he was quickly re-programme by a cautious Smith. “He was on to me! It did start like that, in the second round his nose went and was probably broken and I could see his face starting to get marked up. Then in the sixth round I started dropping my hands and landing more, before in the seventh round both my hands were down, I was making him miss and landing shots. “I came back to the corner and Al gave me a little bollocking! He just said ‘don’t switch off, we’ve worked so hard for this’ and, fair play to Sam, he is a strong fighter and if I took a silly shot with my hands by my waist it could’ve been the end of it. “He drilled it into me to stick to the gameplan. Watching it back, if I had stayed in that rhythm and keep landing at will, he would’ve got frustrated and probably walked onto a big shot or shots and it might have been it. Smith’s safety-first mantra was certainly sound advice, given that this was second time round for Skeete after dropping a narrow decision to Frankie Gavin for the same titles back in November 2014. He has had to play the waiting game and observe Gavin vacate his titles to create a path for fellow Brummie Eggington, replenishing his own fighting stock with a WBO European belt, with the key objective of being reinstated as a mandatory challenger. Skeete being offered voluntary shots at titles is an unlikely scenario given his knack of unpicking the cagiest of defences. “No, with the Gavin fight I was a big, big underdog but I went in with 100 per cent confidence that I was going to win. To this day I feel I did enough to win, but it was a close fight. “I didn’t moan that I didn’t get the decision, I dusted myself down and it did feel like it was a long journey back but, fair play to Frank (promoter, Warren), in the ring on the night I got beat he said to me that my next fight was going to be a title fight and he would get me straight back in at title level. He said it was a learning fight, if anything, and that I hadn’t done myself any harm, perhaps more the world of good. “He was true to his word, in my next fight I boxed for the WBO European title, got straight back into the world rankings. It did seem like a long process, but I got some good wins, had some good fights and it put me in the mandatory position. Skeete’s approach to the sport as a skilful science is not always going to find favour with the scoring judges, which he probably found out to his cost in the ExCel Arena encounter with Gavin. His hit and opponent misses method is boxing in its purest form. Engaging in a slugfest not for the Penge purist. “That’s it, I’m not one to go in there crash, bang wallop sort of fighter, I am more of a technical counter puncher. Even now I haven’t got that style, I went into the Eggington fight knowing I didn’t have it. Everyone was talking about it as the boxer v the brawler, but he couldn’t stand there and do what he usually does – I didn’t allow him to. “Literally it is all on the night, but what you see is really what you get with me. A lot of people are realising now that I can punch a lot harder than they think I can and I am a lot tougher and stronger than people think too. “It all comes with experience, that is what I have now got and that is what took me through the Eggington fight,” he considered, adding that he anticipated a tougher assignment from the normally marauding man from the midlands. “I did, I thought he was gonna bring a lot more pressure and a lot more shots. He tried to stand and box me. They were talking about it before the fight and I thought that if he does that then he is in trouble. Not many people in the division can stand and box me. Ringside audio indeed captured Eggington’s trainer Jon Pegg imploring his man to abandon the boxing and just fight in the second half of the encounter. The second half of the fight not only saw Eggington’s team switch tactics, it also saw the host commentators switch horses after six rounds of attempting to convince viewers that it was a close run thing. It took the third man Paul Smith to eventually steer his co-commentators towards a logical assessment of what was playing out in front of them. Skeete was not overly surprised by the summaries of his success when he watched it back. “Yeah, but I was always expecting that from Sky commentators. It took them a while, but they had to give me some credit. I thought I was winning the rounds clearly and they were saying it was ‘what you like’ sort of thing. “I know Paul and he picked me to win the fight, as did Jamie Moore, but with TV being their work they were a bit biased when the cameras were on, but true colours had to come out. 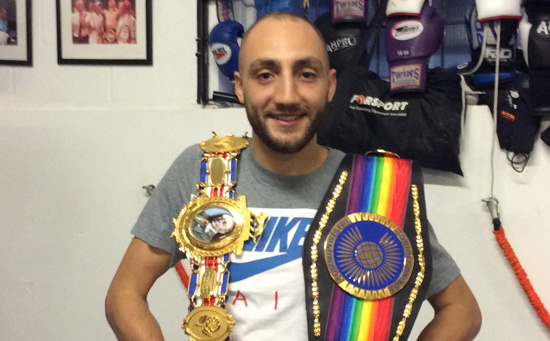 In the aftermath of his belt shopping in Birmingham, Skeete keen to spend some moments of reflection with the key influence on his own journey in professional boxing. Even before the fight he revealed that his first stop with the spoils of his night would be to Greenwich and the memorial bench of his former manager and mentor, the late Dean Powell. For Skeete there was the knowledge and satisfaction of vindicating Powell’s unswerving belief in his potential and abilities. “It was good because for Frank and Andy (Ayling) in the office, who he had bigged me up to, it all came together and it is like it is done, sort of thing. But there is a lot more to be done now, it is not just the British and Commonwealth titles I want to win, I want to go all the way. The moment was logged by Skeete on social media including the hashtag #AllTheGeorgie, which was Powell’s regular sign-off line, although the meaning of it was a little lost on Skeete at the time. His current manager Ayling is meanwhile sitting on a five grand bounty courtesy of a bet on the outcome of the fight with his Matchroom counterpart, with Skeete’s share of the proceeds to be received via the gift of a pricey wrist watch. Hopefully the watch will be in place before the first defence of his belt, which Skeete suspects will be around June time as he sets off on a preferred course that he hopes will lead to him keeping the prize Lonsdale belt after seeing off three contenders. Should this be too long a route to travel with willing opponents thin on the ground, he accepts that major opportunities must be grasped – especially given he is now ranked seven in the WBO charts. “I want to defend it and win it outright. It is the British title and it means a lot to me, so to have it outright would be massive. “Time is the thing, with being ranked high by the WBO and I could fight for the European title tomorrow and win it, if those sort of fights come I’ve got to take them. But the thing is I can always come back to British level. “If it is there and I can get the defences in I will do it, but if the opportunities come it is a business at the end of the day and I’ve got a little girl to bring up and give a good life to. So if I can get big fights and big money, then why not? And ‘All the Georgie’ for that!